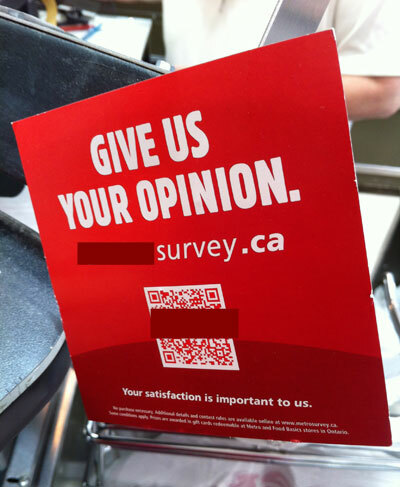 A regional grocery store chain in Canada is currently running a campaign to solicit customer feedback from its shoppers. Their use of Point-of-Sale advertising is great – they appeal to the shopper who is checking out and there is a QR code front and center (as well as a simple URL) for users to access the feedback form..
Then, there is the customer feedback form… Included below is the first page of the form. As you can see, it is quite an exhausting page that requires a serious time commitment. There is a prize draw entry to compensate the user for their time, but we at Comment Box feel like a long customer feedback form like this likely has a very high abandonment rate. The point here is: if you ask for too much from your customers, you risk losing them before you get any comments at all, and this defeats the purpose of asking for customer comments in the first place. © 2013 Comment Box. All Rights Reserved.